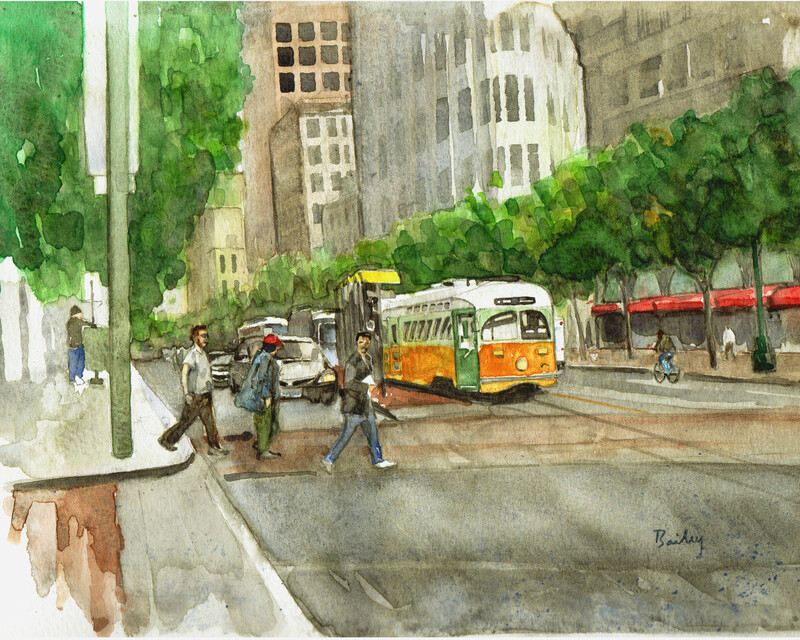 This entry was posted in Watercolor and tagged Architecture, Art, Cityscape, Market Street, San Francisco, Watercolor by theartofbrian. Bookmark the permalink. Wow – how do you create such fine detail with watercolor? Extraordinary artwork! Thank you! I feel like there is always more to learn about watercolor so I just keep trying to learn a little each day. Sometimes, I put in details with a small dry brush and sometimes they just fall into place by moving quickly and expressively. I often feel like the goal is to move as quickly as possible while staying mindful. Thanks again! Great tip – thanks Brian. I am VERY new to trying and going with the loose and abstract look for now 🙂 LOL! Neat! Still on Yupo? Good variety in the distances of the people and actions – I like the biker. Thank you! I actually ran out of Yupo so back to 140 lbs cold press but I’ll definitely get more in the future. Thank you very much! Encouragement keeps everything moving! Do you draw & paint right on the street? I split my time between drawing and painting outside and working from photos. Sometimes I draw outside and lay down the larger color areas then finish at home. Good job! I like the addition of people, Brian.